David will captivate and enthrall your guests and family members during your wedding reception in Birmingham. Full planning will be provided for your party in Birmingham by David Fox: the world-class master of mystery and intrigue. 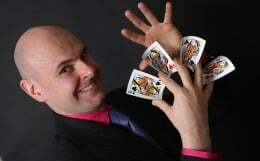 For corporate events in Birmingham, David is the first choice magician for many major companies. 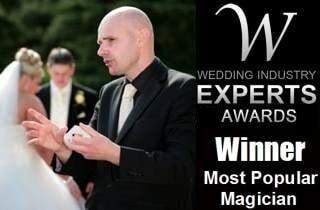 Do you need some exceptional world class magic in Brimingham? If you are planning a wedding, party or corporate event in or around the Birmingham area, Birmingham magician David Fox is a fantastic choice of entertainer! His close-up effects are astounding and he can also provide an exciting stage show of classical illusions. A proud member of the exclusive Magic Circle, David has over a decade of experience performing in the Birminghamshire area. He recently performed at Cafe Bluu and the Retro Suite in Birmingham city centre. For trade events and promotions, David Fox is ideal and his appearance at the Birmingham NEC on behalf of Vanguard Logistics earned him much acclaim. David also provided close-up entertainment and a wonderful stage show for everyone present at a very large Asian event in Edgbaston on the banks of Edgbaston Reservoir. His personality is perfectly suited for people of all age groups and cultural backgrounds. For weddings in and around Birmingham, and throughout Birminghamshire, Mr Fox is a proven expert in this field. The 2014 Wedding Industry Awards winner of 'Most Popular Magician', he is certain to be a magnificent hit on anyone's special day. His recent demonstrations of card miracles, mind-reading and sleight-of-hand at the Forest Hotel on Station Approach in Solihull created quite a stir to say the least. Please feel free to explore David's website and should you wish to discuss magic for your special event please do not hesitate to give David a call, send an email or submit your enquiry through the form on the contact page. Indeed, David's new fast text messaging service is excellent for businesses who need a quick response.